About this Feast Day and St. Peter and St. Paul, Apostles: The festival of St. Peter and St. Paul is probably the oldest of the saints’ observances (dating from about the middle of the third century). An early tradition held that these two pillars of the New Testament Church were martyred on the same day in Rome during the persecution under Nero. In addition to this joint commemoration of their deaths, both apostles are commemorated separately: Peter on January 18 for his confession of Jesus as the Christ (Matthew 16:13-16) and Paul on January 25 for his conversion (Acts 9:1-19). The confession of St. Peter did not arise in the imagination of Peter’s heart but was revealed to him by the Father. The reason this confession is important is seen in Jesus’ response: “You are Peter [Greek Petros], and on this rock [Greek petra] I will build My church” (Matthew 16:18). As the people of God in the Old Testament began with the person of Abraham, the rock from which God’s people were hewn (Isaiah 51:1-2), so the people of God in the New Testament would begin with the person of Peter, whose confession is the rock on which Christ would build His Church. But Peter was not alone (the “keys” given to him in Matthew 16:19 were given to all the disciples in Matthew 18:18 and John 20:21-23). As St. Paul tells us, Peter and the other apostles take their place with the prophets as the foundation of the Church, with Christ Himself as the cornerstone (Ephesians 2:20). The confession of Peter, therefore, is the witness of the entire apostolic band and is foundational in the building of Christ’s Church. 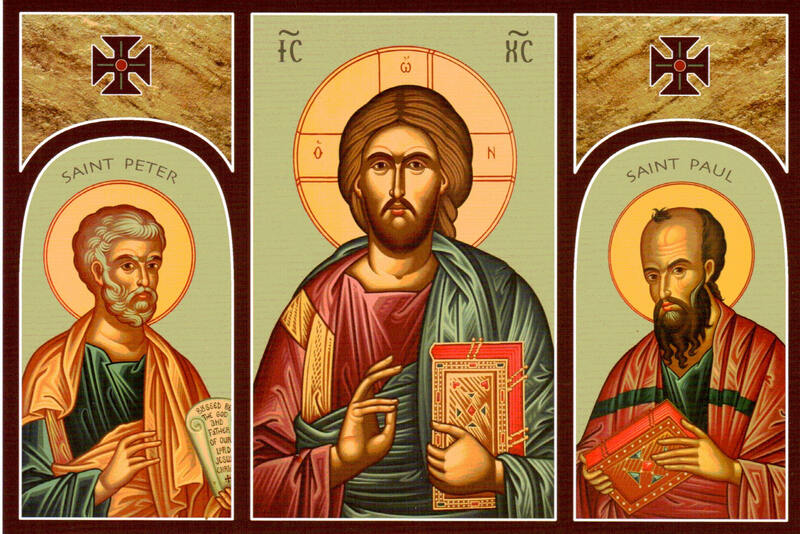 Thus the Church gives thanks to God for St. Peter and the other apostles who have instructed Christ’s Holy Church in His divine and saving truth. St. Paul’s life-changing experience on the road to Damascus is related three times in the Book of Acts (9:1-9; 22:6-11; 26:12-18). As an archenemy of Christians, Saul of Tarsus set out forDamascus to arrest and bring believers toJerusalemfor trial. While on the way, he saw a blinding light and heard the words: “Saul, Saul, why are you persecuting Me?” Saul asked, “Who are You, Lord?” The reply came, “I am Jesus, whom you are persecuting.” In Damascus, where Saul was brought after being blinded, a disciple named Ananias was directed by the Lord in a vision to go to Saul to restore his sight: “Go, for he is a chosen instrument of Mine to carry My name before the Gentiles and kings and the children of Israel” (Acts9:15). After receiving his sight, Saul was baptized and went on to become known as Paul, the great apostle. Reflection: Those who would remake the Church into what they want and desire, will eventually have Christ Jesus remade into their own image, that is, an idol. Too many build the Church upon men’s opinions of Jesus Christ. Our Lord’s question to the disciples, Who do men say that I am? was never intended by the Lord to be an eternal discussion question for so-called Bible studies in too many congregations. Every year, before Christmas and Easter, come the articles debunking some portion or portions of the Bible about Jesus, like clockwork. The Lord’s question to Peter surfaced the rumors about Him and they were just that: rumors, conjecture, innuendo. Peter and Paul knew that Christ is the only Cornerstone of His Church and that all who were being baptized, were being built onto the Cornerstone,not the cornerstone upon them! See Acts 4:11,Ephesians 2:20, 1 Peter 2: 5-7. The Holy Spirit conforms us to the Lord’s specs in the blueprint of His Church, by His mercy for sinners, not according to our specs and schemes for His Church. “Behold of a sudden the lover is a liar. (Peter) finds out what he is; he who had thought too highly of himself” (St. Augustine). Peter’s tears were of godly sorrow that leads to repentance. Both built well with the Word of God upon the sure Cornerstone Jesus Christ. Neither Peter or Paul built the Church upon themselves, their spiritualities or the fads and fashions of this vain world. Both were martyred, tradition says on this day, in Rome. Remember and rejoice that Peter and Paul, and all Christian martyrs, unlike the Islamic variety, do not try to take people with them in death, but ever preached and taught, the Way to heaven, in faith, not to kill the infidel, but that the infidel come to faith and live eternally in Jesus Christ. Merciful and eternal God, Your holy apostles Peter and Paul received grace and strength to lay down their lives for the sake of Your Son. Strengthen us by Your Holy Spirit that we may confess Your truth and at all times be ready to lay down our lives for Him who laid down His life for us, even Jesus Christ, our Lord, who lives and reigns with You and the Holy Spirit, one God, now and forever.